You have heard of Volume Spread Analysis and the value it might add to your analysis. But it sounds like a convoluted trading method with uncommon terms like “No Demand Bar” and “Stopping Volume”. Is VSA really that inaccessible? Together, let’s take the first step to understanding VSA. With this guide, you will find that VSA is an intuitive method after all. WHAT IS VOLUME SPREAD ANALYSIS (VSA)? VSA is the study of the relationship between volume and price to predict market direction. There are three big names in VSA’s development. Jesse Livermore spoke of a theory based on market manipulation. He also worked his theory in his legendary trading career. However, he did not pass down concrete trading methods. His legacy is that of a trader and not an educator. Richard Wyckoff was much more interested in education. To find methods that work in the markets, he interviewed top traders including Jesse Livermore. Wyckoff proposed the idea of a “Composite Trader” that embodies the entire market. He used the “Composite Trader” to explain the market phases of accumulation, markup, distribution, and markdown. Neither Jesse Livermore nor Richard Wyckoff used the term “Volume Spread Analysis”. It was Tom Williams who used the term to describe the methods he built based on the Richard Wyckoff’s ideas. Tom Williams’ books and software has helped to propel the concepts of VSA among traders. The basic idea is that the public can only make money from the markets if we understand what the professional traders are doing. And professional traders are not small players. They play big. Hence, they leave their footprints in volume data. When the professionals are active, the market shows high trading volume. Conversely, when the market volume is low, the professionals might be holding their horses. It follows that in order to get a sense of what the big guys are up to, looking at just price action is not enough. We need to look at price together with volume. DOES VSA WORK IN ALL MARKETS? VSA focuses on price and volume and seeks to find the actions of professional traders. Hence, as long as a market has a group of professionals and offers reliable price and volume data, the trading premise of VSA holds. Almost all financial markets (stocks, futures, forex) seem to fit the bill. However, in the spot forex market, volume is a tricky concept. You will not get actual traded volume. You get tick volume which measures the times the price ticks up or down. If you intend to use VSA methods for trading spot forex, you need to decide if your source of tick volume is a reliable proxy for actual volume. HOW DO WE USE VSA TO TRADE? Nonetheless, we can still improve our trading with basic VSA concepts that are easy to understand. Hence, in this first guide, we will look at two simple VSA concepts. If the market rises with contracting spread and volume, the market is not showing demand. Without demand, it is not likely to continue rising. 1)Price closed higher than the previous bar. 2)Volume is lower than past two bars. If the market falls with decreasing spread and volume, the market is not interested in selling. Thus, it is not likely that the market will continue to fall. 1)Price closed lower than the previous bar. In the two examples below, we will use a 20-period simple moving average as our trend indicator. Our aim is to use the concepts of “No Demand” and “No Selling Pressure” to find trend retracement trades. This chart shows the daily bars of Deere & Company (DE). 1)This bar punched below the SMA and hinted at an impending bear trend. 2)These three consecutive “No Demand” bars confirmed the lack of market interest to resume the bullish run. 3)Hence, we had a great context for considering a short trade. This chart shows the daily bars of The Proctor & Gamble Company (PG). 1)The market was in a strong bull trend and remained above the SMA. 2)In this sideways pullback, we observed three “No Selling Pressure” bars. 3)They hinted that the bears are not forthcoming, and the stage for a bullish retracement trade was set. 4)This bullish Pin Bar offered the ideal setup bar. WHERE CAN WE LEARN MORE ABOUT VSA? VSA is gaining in popularity, and there is no lack of resources to advance your understanding. But I am sure that no software will bring you trading success unless you truly understand the VSA principles. Hence, you should definitely learn as much as you can about VSA, before relying on a software for your analysis. These are not classic VSA methods, but they will help you understand the interaction between price and volume. Volume is valuable because it offers another market dimension for analysis. Volume is also dangerous because it confuses those who do not understand it. Take one step at a time. Pick up VSA concepts steadily and use them in your trading prudently. Once volume starts to make sense to you, you will see progress but improvements will not come overnight. 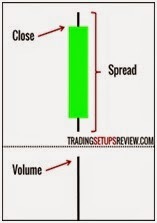 Volume Spread Analysis – look into volume, spread and close. we will also keep in mind the general background of the market. The best entrances within a trend is when we see a no supply (within an uptrend) or a no demand (within a downtrend). Why? The professionals (market makers and syndicates) want to test for professional interest in a given direction. The tests (no supply, no demand) give us an idea of the supply/demand balance and professional interest and that's what we're looking for to determine strength and weakness. No supply: A bar that goes up, yet closes off its highs and has lower volume than the previous 3 bars. 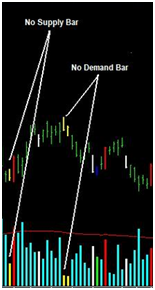 No demand: A bar that goes down yet closes off its lows and has lower volume than the previous 3 bars. 2. No excess supply coming in. 2. No excess demand coming in. Exits: Excess supply/demand coming against you on lower TF's or ND's/NS's in the other direction. Notes taking from PDF files from Volume Spread Analysis book. 1) One of the most important characters of congestion areas is the Low Volume. When most traders are bullish or bearish the volume is high. 2) Accumulation area: a)Indecision should be visible. b) volume should be narrow. (low and quite). No huge upsurge. c) The spread of the bars(High-Low) should be narrow. d) Volume should shrink near the support line and expand near the resistance line. f) check on the volume pattern as well. The volume need not be very high at all. Since there is no supply (SM have the majority of the floating stock). If the volume is moderate we should see it coming in strongly soon. Otherwise the move will collapse and stock would return to the base. We should see a large swift increase in the volume in case of a genuine breakout. The stock should be closing near the top. Also too much volume is not good. It would mean too much supply is coming in. Heavy volume with the stock closing in lower half would definitely mean supply coming in. Typically an 150% increase in volume with the close near the top would indicate a successful breakout. The breakout is just the beginning. Then the stock moves up in stages. Each stage would be an advance at higher volumes and a retracement at lower volumes. SM may be absorbing the stocks to start the game again. You would find a High volume bar with long spread and closing near the top. An Upthrust Bar is a wide range bar, with a high volume and closing down ( towards closing hours). Upthrusts with low volume - I call them Pseudo Upthrusts. 1) High Volume and How high? 3. Close, near or on the Low? 5. Did the bar into new territory? 6. Is the stock in an uptrend? Wider the spread more potent the Upthrust . Lower the closer the stronger the indication of weakness. If the close is towards the middle it would mean than the SM was not successful in marking the price down. There was too much demand. Upbars with high volume with narrow spread and closing in the middle or low indicates that supply is swamping the demand. This kind of bars would normally be seen near resistance lines. This by itself does not portend great weakness. But the following bars would indicate whether the supply is persisting or not. No demand bar is a Upbar with narrow spread closing in the middle or lower and the volume is less than the volume of the previous bars. A No Demand bar indicates that there is no support from the SM. If the background does not show weakness the No demand bar does show weakness and does not necessarily Indicate reversal. It only shows lack of participation from SM. We may soon see the SM moving in to take the stock up further. The Testing for supply is done by rapidly marking down the price. If the stock recovers towards the high and the volume is low it would mean that there was no supply. If the volume is high and if the stock fails to recover it would mean that there still supply present. Low volume or less trading activity indicates a successful test. A TEST bar typically dips into a previous high volume area and recovers to close near the high on low volume. If there has been absorption volumes just before the Test bar the strength of the test bar becomes more significant. Down bar with high volume bar closing on the upper side. This is called a Stopping volume. This indicates that the SM is absorbing all the stocks. However most of times you would see the close on the upper half of the bar. Upthrust bar we will find in a bearish move a High volume wide range up bar with the low chartering into new lows and the closing will be near the high. The reverse Upthrust is rare and is found rarely at bottoms. Any high volume wide range upbar in a down trend would indicate strength. No Supply bar is a narrow range low volume down bar closing in the lower half. A No Supply indication has to be read in context with background. Resistance areas are zones where selling pressure increase and Support areas represent zones where buying pressure increases. **Increased volume with increased spread as the stock approaches a resistance area is a bullish sign. **Decreased volume and spread as the stock approaches support area is sign that the stock would take support in that area and reverse. 2. Large spreads. Especially Effort to Fall bars. I am a follower of VSA for a long time. Previously I used technical analysis like Fibonacci, etc. But it is not as accurate as VSA. VSA really spot SMART MONEY movement. However it is time consuming to identify the candles etc. Thanks for the learning materials. ForexTrendy is a revolutionary application capable of finding the safest continuation chart patterns. It scans through all the forex pairs, on all time frames and analyzes every possible breakout. technical-analysis is a trading tool employed to evaluate securities and provides accurate forecasts which are prepared by expert technical analysts. Join us in our Facebook to receive the latest updates. Click here to join us in our Facebook group. 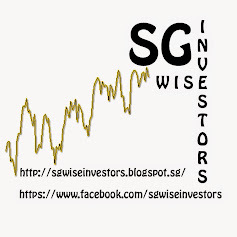 The purpose of this blog is not intended to induce or promote any insider trading or manipulation activity. This blog is created for the sole purpose of education, discussion and knowledge sharing. All charts and information can be obtained freely from the public internet. All analysis are based on my own personal view and years of experience. It should not be used as a decision to solicit buy/sell activity. Use all information at your own discretion and practice due diligence.